Peel grapefruit and orange and separate sections. * Cut each section into 2 or 3 pieces and place in a large bowl. Core apple and pear (don’t peel them). Slice each fruit into 6 or 8 wedges then cut each wedge into 3 or four pieces. Add them to the grapefruit and orange. Add berries to the bowl as well. Mix fruit with lime juice and torn mint leaves and a drizzle of honey. *For a fun presentation, cut grapefruit and orange in half before peeling and remove the inside in one piece (if possible) with a spoon. 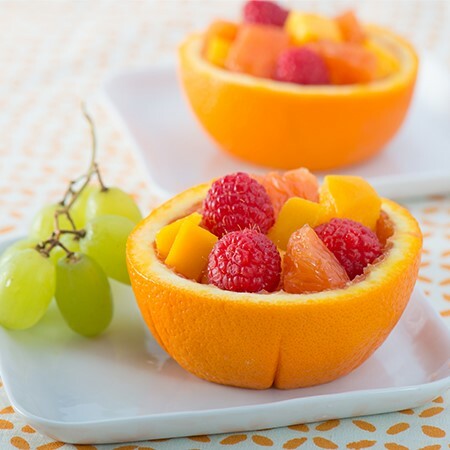 Reserve the citrus halves to use as bowls for the fruit salad.